It was a typical CSA pickup. I checked in. Grabbed my peaches, then started towards the veggies. I came across the usual leafy green suspects, turnips, lettuce and then stopped. I stared into the bin. A large, slightly misshaped purple thing stared back at me. Hello kohlrabi. Think broccoli stem, but more round and purple. It was seriously ugly with a few stems haphazardly extending from its base. Certainly new to me, but after being a CSA member for three years, not much phases me anymore. I picked it up, added it to my haul and headed home without the faintest idea of what to make. Kohlrabi is a cross between cabbage and turnip and its name appropriately means “Cabbage Turnip” in German. 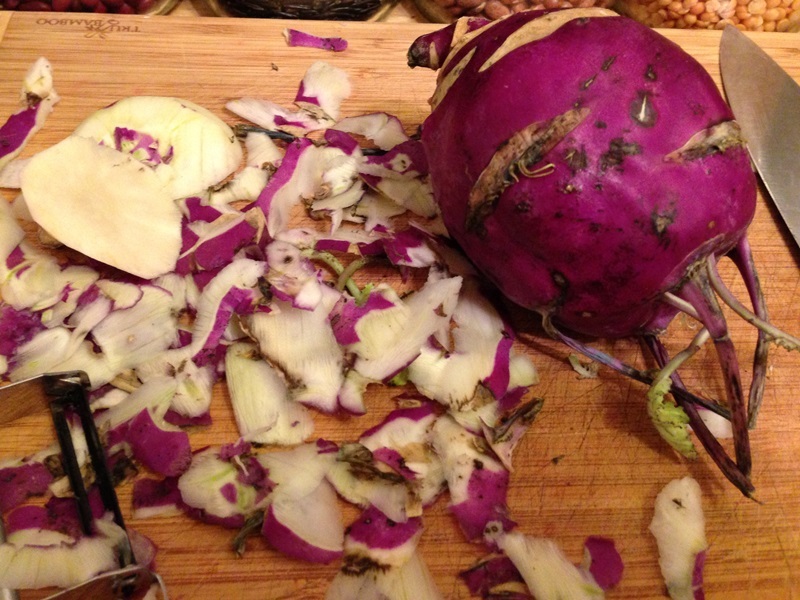 After separating the leaves (or what was left of them) from the stems, kohlrabi can keep in the refrigerator for several weeks. It’s a cool weather crop so is usually available in spring and early fall. From photos I’ve seen, it appears that straight greenish is the more popular color, but purple kohlrabi are sometimes available. On the healthy side, it’s packed with vitamin C, low in sodium and there are only about 40 calories in a cup. Kind of makes you wonder why there was never a kohlrabi diet fad, doesn’t it? Generally when I don’t have a plan for how to prepare a piece of food, I look to items and how I’d prepare them. With the kohlrabi bulbs spread out on the table, they looked like giant, less smooth versions of the turnips I had sitting along side them. It was one of those chilly summer nights, prefect weather for cranking up the oven and roasting some veggies. As with most colored fruit, I was disappointed to find the flesh under the kohlrabi’s exterior to be a bland shade of white. I peeled the bulbs, diced them into manageable bite and spread them in a baking dish with quartered baby turnips. Instead of my shake and oil method, I opted to brush the roots with olive oil, sprinkle with spices and toss before roasting for a good 45 minutes. Lumped together on a plate, it’s almost impossible to discern the kohlrabi from turnips. It was only in my mouth that I got a pleasant surprise. The kohlrabi took on a light almost sweet flavor, similar to what you’d expect from roasted squash, though still much firmer. With an extra sprinkle of sea salt, it was the perfect companion to our steak that evening. Next time I wind up with this treasure in my Park Slope CSA share or greenmarket bag, I might select a few other roots to roast along side with some rice or couscous for a hearty Meatless Monday option. Preheat oven to 400°F. Spread turnip and kohlrabi cubes in a large casserole dish. Drizzle with olive oil and sprinkle with spices. Mix well to combine. Bake for 45-50 minutes until vegetables are browned and tender. Mmm, the slaw recipe looks great. I loved how when I roasted the kohlrabi, there was still a bit of crunch. I can only imagine how good it would taste in a raw dish! Hopefully I get some more this year and can try your recipe. I have never made kolhrabi before, this sounds delicious. I will find some and try it. Love roasted roots. That’s the advantage of CSAs, you get ingredients that you might not normally buy on your own and are forced to make something with it. That’s how I discovered garlic scapes! 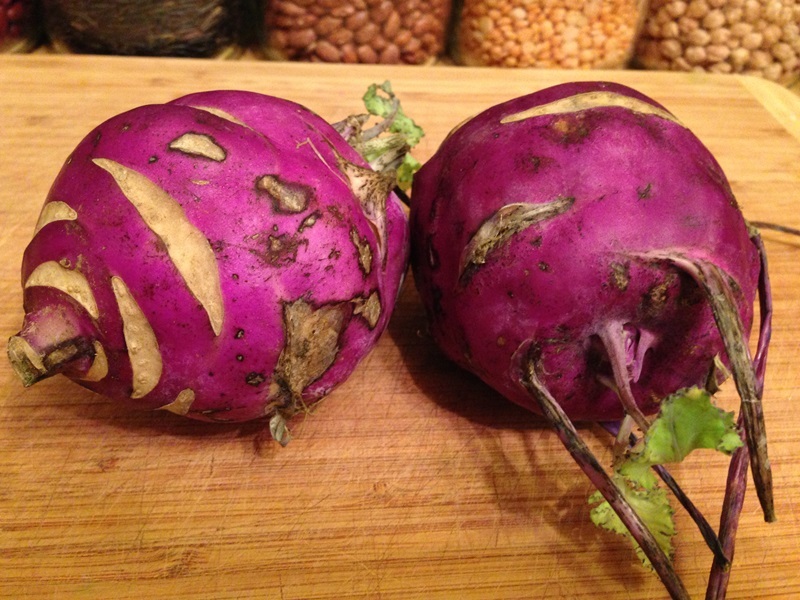 Now I want to seek out kohlrabi at the markets to experiment more. I included my CSA kohlrabi in some delicious roasted vegetable enchiladas recently- delish. I love it! I didn’t give you the link-http://thebrookcook.wordpress.com/2013/07/24/roasted-vegetable-enchiladas-with-creamy-tomatillo-sauce-and-melted-cheese/. I have also thrown it in chicken and dumplings. Yum. Oh wow, those look really good. Another recipe to try. I always think of root veggies as a side dish, never really in something. Love the enchilada approach! Thanks for the link to my summery kohlrabi soup! 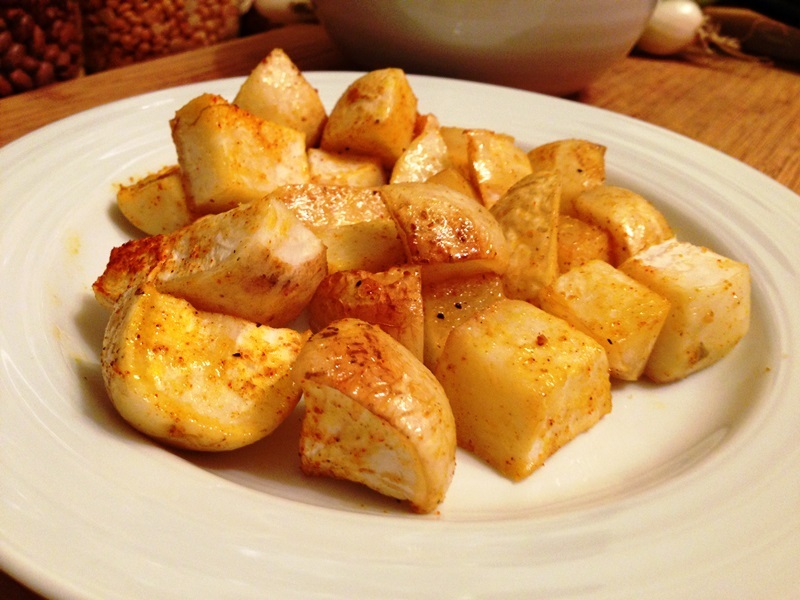 I will have to try roasted kohlrabi; it sounds great! You’re most welcome! I loved roasting the kohlrabi but kind of wish I saw your recipe first. I am definitely a soup girl and love discovering new blends. Will try it next time I get my hands on some. You’re welcome. I worked on Just Food’s veggie tip guide that has a listing of pretty much every fruit and veggie that grows in this region. I was surprised how many things seemed completely foreign to me (like kohlrabi, and last year mizuna). I feel I need to walk around with the guide as a shopping list one day! When pulling leftovers in the fridge next day, I almost reached for the kohlrabi and turnips before the steak. They were kind of irresistible.